Andi spent the weekend at Ping Zero 49 in Auckland – here's what he saw. As a geek growing up in the late '90s and early '00s, LAN parties at a friend's place were a staple of my teenage weekends. The long hours of gaming, the seemingly endless world of file-sharing, and those moments when the parents came downstairs at 3am and told you all to "shut up and go to sleep". Best of all was getting home at the end of the weekend and finally getting some sleep. I may have grown up somewhat, but so has multiplayer gaming: LAN parties are now a rare occurrence, and I suspect many in the latest generation of gamers have probably never experienced one at all. With high-speed Internet making multiplayer gaming almost ubiquitous, and streaming services offering legal alternatives to file sharing, why would anyone bother lugging their computer, monitor, cables, and everything else along to a LAN event these days? Ping Zero's answer is simple: e-sports. 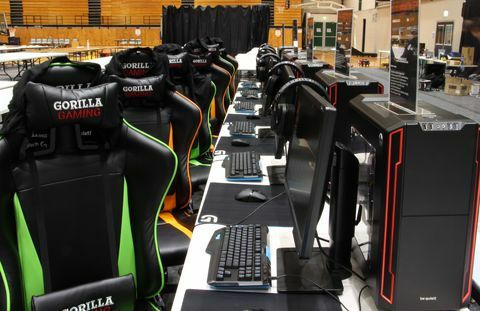 The long-running LAN event has kept the bring your own computer mentality of yesteryear, but infused its gatherings with the competitive atmosphere that games like League of Legends, Starcraft, and Call of Duty use to fill stadiums. Eager to see whether such a tactic could keep LAN events alive in New Zealand, on a wet and windy Friday evening I descended upon Ping Zero to return to the multiplayer experience of my youth, and to see what a modern LAN event looks like. Ping Zero 49's North Shore Events Centre location seemed rather poignant when you consider the rise of e-sports in New Zealand. Growing up on the Shore, I frequented the Centre when playing high school basketball, or when tagging along with Mum and my sisters to watch netball. Now, a new generation of sports has taken over. Doors were set to open at 6pm, and by 5:30pm a queue of attendees had already formed. In a hallway that in the past may have housed sweaty and tired players, there instead stood a line of eager video gamers, the glisten of sweat replaced by a sheen of rain. An attendance of more than 350 people was expected – with most showing up early Saturday for the tournaments – but here were the dedicated dozens that were in it for the long haul. "It made a lot of sense to move here," Ping Zero head organiser Conrad 'Major Havoc' Ware told me. "When we looked at past ticket sales – at who was coming and from where – there was a large number of attendees from the Shore." Previously held at The Trusts Arena, Ping Zero had outgrown that facility and needed to set its sights on a new location in order to accommodate growing numbers of attendees. 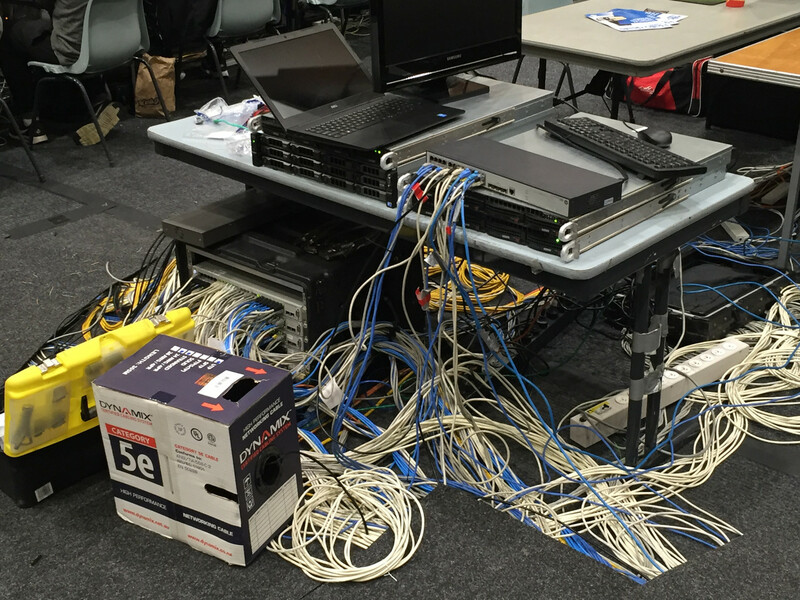 However, the change came with unforeseen setbacks: in order to protect the Centre's courts and hide the hundreds of meters of network cable needed for an event such as this, the arena needed to be carpeted – a task that set the Ping Zero team back by more than three hours. "It's a new venue with a whole lot of unknowns," said Ware. "It's the first time we've ever run an event on a basketball court, and to keep ticket prices down we decided to lay the carpet ourselves." The headache didn't stop there for the organisers, either. Once attendees were set up, they quickly discovered that access to the Internet was severely limited. Those looking to match-make in Overwatch or download the latest patches and updates had to endure crippled connection speeds. Nevertheless, spirits were high. "It's a social event beyond anything else," said longtime Ping Zero attendee Simon, who had come all the way from Christchurch for a conference and – more importantly – to jam some games. He, like many others, wasn't too fussed by the lack of Internet, and instead socialised and played in offline mode. "Ping Zero for the longest time was out in Hobsonville in the old air base, and there was no Internet at all," he added. "That was the thing about LANs. You'd go around to a friend's place who was probably on dial up, which meant you couldn't do things online." Next to Simon was an old friend of his that gamed under the name 'Haywire'. The two play online every Wednesday, but see events like Ping Zero as an opportunity to catch up in real life. "You get to play multiplayer against people you can actually see," he noted. Similar scenes were playing out around the arena. Some stayed at their computers and played local multiplayer or single player titles, while others got up and went to talk with other attendees. Some commiserated over the lack of Internet, while others went to see what everyone was playing. 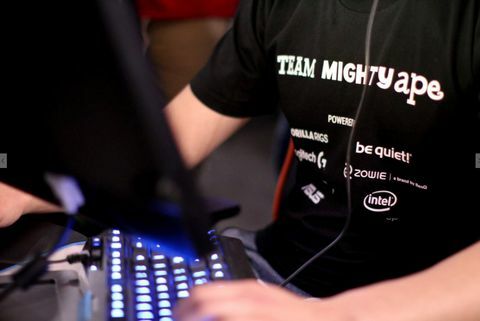 TeamMightyApe seemed oblivious to the outages, as all CS:GO matches were being hosted locally. A steady stream of observers hovered around the seasoned players, who were running scrims in preparation for the following day's tournament. The evening continued with the steady onslaught of rain on the arena's tin roof being punctuated by cries of joy from victorious competitors, taunts shouted at a losing side, and howls of frustration as the limping Internet connection caused another disconnect. And then, at 11:43pm the information superhighway returned in full force. From that point on it seemed like every gamer I walked past was playing CS:GO or Overwatch. Other titles popped up sporadically throughout the sea of glowing monitors. A string of desks were allocated for Dota 2 players, while a group of Street Fighter V fans were duking it out at the back of the arena. Elsewhere, someone had an HTC Vive running, and was blindly pawing at the space around them. There was even a clan of Destiny gamers that had brought their PS4s in order to run the game's Iron Banner event over the weekend. As the night continued, more and more people disappeared to the dedicated sleeping room, while others simply curled up under their desks. Saturday morning started off slowly, as one-by-one players woke up and got back to their computers. Tournaments kicked off just after 10am, with main events for CS:GO, Overwatch, and Dota 2 all running concurrently. Each was run through Battelfy using Swiss-system rules, which have competitors paired using a predetermined set of rules designed to ensure that each plays an opponent of similar skill. The resulting matches became closer and closer as the rounds progressed, with points being totalled to decide which teams progressed through to the next round. Overwatch had eight teams competing, Dota 2 saw 10, and CS:GO attracted 13 teams. However, Overwatch was hugely popular outside the tournaments, so it wouldn't be surprising to more competitive teams at subsequent events. As the day progressed, a noticeable difference in chatter could be felt throughout the centre. Gone was the social buzz, replaced by a tense focus that was only punctuated by an eruption of cheers and the occasional smattering of applause. A much needed break was offered around 3pm, when Burgerfuel showed up with free burgers, but after some quickly scoffed sliders, competitors were straight back into it. Semi-finals commenced at 7:30pm. At this point, players had been at it on and off for more than nine hours, and still had many to go before a winner could be decided. 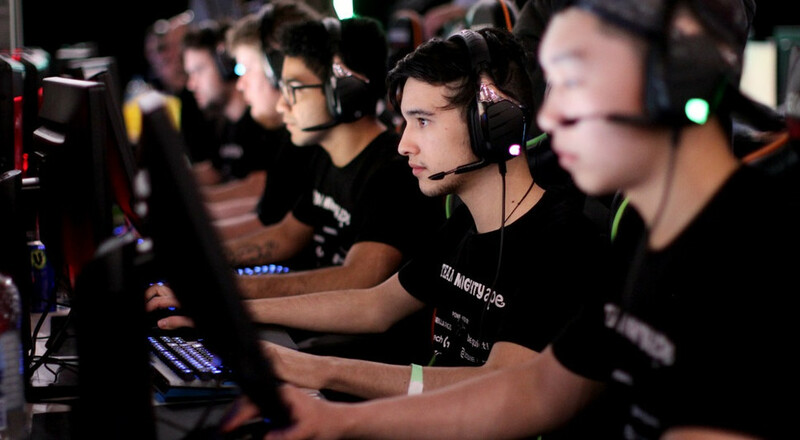 It's often easy to dismiss the physical side of e-sports and the toll it can take on a player, but bloodshot eyes, cramped wrists and fingers, and stiff necks spoke to the endurance needed by these competitors. Overwatch team Nerf This! were quickly becoming favourites to take out the title, having only lost a single round (not an actual point) to Lessthan3, a team that had formed at the event. The two teams would go on to face off again in the final, with Nerf This! playing an aggressive two tank, two healer, two damage line-up. Nerf's team captain 'AVRL' coordinated a fearsome onslaught when playing both offence and defence that ultimately won them the finals 3-0. "Second place isn't bad considering we're a hodge-podge group of players, so we're pretty happy," said 'Jukiki' from Lessthan3. "We were just stoked to make it to the finals." 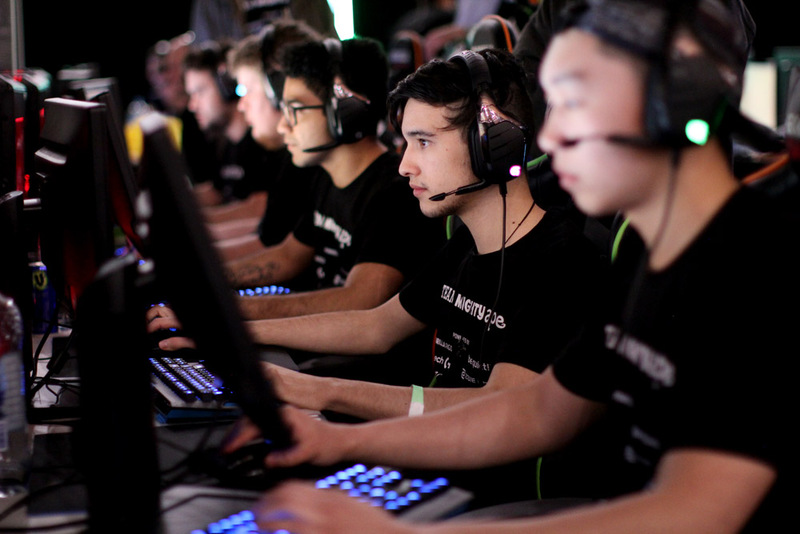 Meanwhile, the CS:GO tournament had seen even more drama, with newcomers Subscript taking an unexpected win over DoMiNaToRs in the fifth round. However, a second face-off between the two teams saw DoMiNaToRs win 2-0, with Subscript going on to tie with ETU for third. 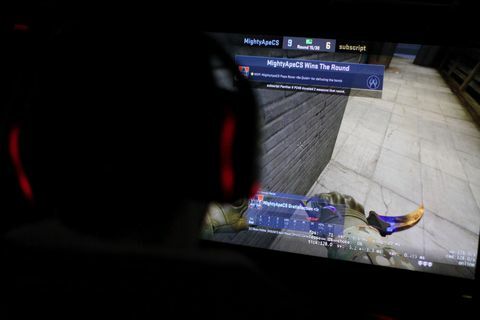 "The last three Ping Zeros have seen a match up between TeamMightyApe [then FireUP] and DoMiNaToRs," explained CS:GO tournament coordinator Daniel 'Mocksey' Slater. "It's great to see that rivalry continue. DoMiNaToRs looked a little shaky earlier today. They lost to some teams that you would have sworn on-paper they would beat, but they've got their form together now and they're playing just as well as they normally do. 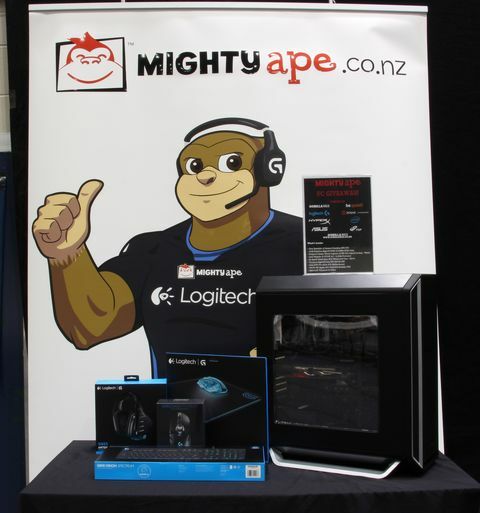 TeamMightyApe are on a roll though. They've got momentum and strength going for them right now and they just look undefeatable." The finals looked to prove Slater right, with TeamMightyApe taking the first round quickly in a 16-5 win. The second round, however, saw DoMiNaToRs pull it back to tie things up. At this point, a crowd had gathered behind both teams, and the eruption of noise behind DoMiNaToRs was deafening. The time was now 1:30am. Both teams had been playing almost non-stop now for 15 and a half hours. Understandably, a much-needed break was taken before the tie-breaker round. Although many looked weary, there was a charge of electricity surging through players and spectators alike. 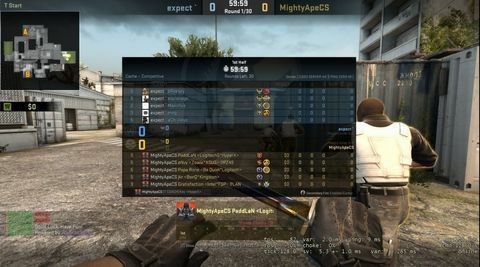 Going into the match it felt like either team could take it, however things quickly turned in TeamMightyApe's favour as they scored points on a notoriously hard map position. DoMiNaToRs held out for a few more rounds, but TeamMightyApe soon put the nail in the coffin. 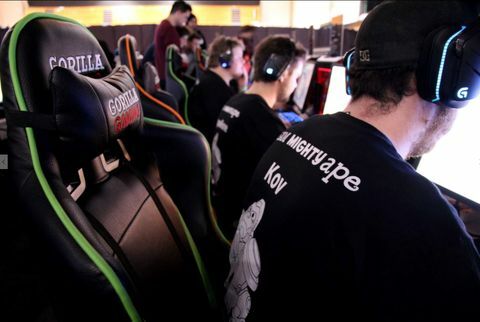 "We really just had fun and played off each other and played to our strengths," said TeamMightyApe's 'eNvy'. "The kind of maps we tried to veto out had a lot of close angles, we wanted to go for a lot of wide angles so things are more spread out and there's more angles for [the enemy] to cover. We're really good at splitting people and making them check too many angles, and then we obviously just hit them all at the same time." It was close to 3am before the tournaments were completely wrapped up. Many felt relieved. The long hours of gaming had taken their toll, with many discussing the need for the tournaments to be split across two days. "We've heard what people are saying," said Ping Zero's Ware. "What you've got to keep in mind though, is if we extend [the tournament] across two days, that's an extra day before we can get into pack up. The Ping Zero guys are all volunteers that already take the Thursday and Friday to get the event ready. If we wrapped up the event on Sunday afternoon we'd all be here into Monday as well with pack up. That's a lot to ask." After a hasty prize giving ceremony that saw more than NZ$3000 awarded in cash and prizes, there seemed to be very little reason for attendees to stick around. Many looked on while attendees started packing up and taking their rigs out to their cars. It was now 3:30am in the morning and the torrential downpour outside was reason enough for some people to stay and (try to) get some sleep. Even so, there was a mass exodus. By 4am, the arena contained no more than 30 players. Ping Zero 49 was, for all intents and purposes, over. Far too tired to drive home, I curled up and tried to get some shuteye. As I huddled under a blanket, listening to one gamer aggressively playing a rhythm game on a mechanical keyboard, my exhausted brain tried to fathom everything that had happened over the weekend. I'd met some incredible people and seen some amazing feats from some of the up-and-comers in the New Zealand e-sports scene. Though rough around the edges, Ping Zero is clearly an avenue through which the social and competitive gaming scene in New Zealand can thrive. Next up is Ping Zero 50, a significant milestone for an event that started in 2002 as a bunch of mates playing games in a garage. What Conrad and his team have in store is a mystery, but I'm told it's already in the planning stage.